In May, Amazon announced one of its most significant changes to ever impact Amazon customer service – an increase to the annual Prime membership fee. On June 16th, renewing Amazon Prime members began paying 20% more for their membership, with the annual fee increasing from $99 to $119. The last time Amazon increased the fee, was in 2014 – a lifetime ago in the online age! Yahoo Finance recently surveyed Prime members and found that nearly 45% plan to drop their Prime membership rather than pay for the price increase. We won’t know how many of them are serious about canceling until the price hike begins to roll out to renewing members. However, our data suggests that an even higher percentage of Prime members may be at risk of canceling. In our May 2018 survey of 1000 Amazon customers, we asked Amazon Prime members how they felt about the value of their membership. 46% of Prime members feel that the value they’re getting out of their membership currently outweighs the cost of the annual fee. For the purposes of this report, we’ll refer to this group of respondents as the Prime Loyalists. 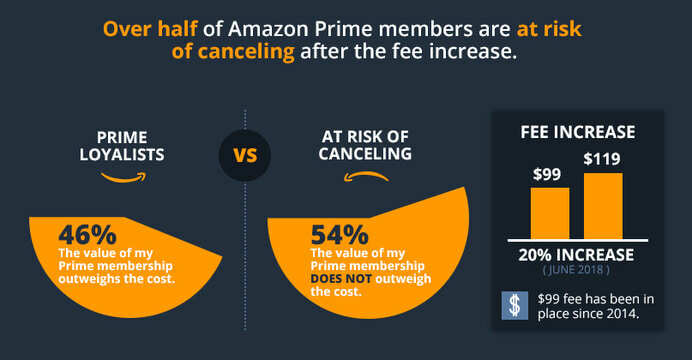 However, the other 54% of Prime members believe the value of their membership does not outweigh the cost, which puts them at risk of canceling their Prime membership. Which customer segments are most likely and least likely to remain on Prime? How will the shopping preferences and behaviors of canceling Prime members change? Which types of products will be safe and which ones will be at risk of losing sales? Prime Loyalists are twice as likely to be parents with young children. The differences are significant between the segments surveyed. 43% of Prime Loyalists have children under the age of 18, compared to only 20% of Non-Members. Family households, where a Prime membership is being shared across multiple family members are, naturally, getting more value out of their Prime membership. This indicates that family-oriented products, like patio furniture, may fare better if a greater percentage of the members canceling are single person households. Meanwhile, sellers of products geared toward single person households will need to do more to accommodate customers that are dropping their Prime membership and foregoing the Prime benefits that came with it. For example, they may need to speed up ship times or offer free shipping at a lower threshold to help convert those Non-Members on Amazon before they turn to another site. Prime Loyalists are 36% more likely to be higher income earners. 59% of Prime Loyalists have an annual household income over $50,000, compared to only 38% of Non-Members. The gap widens as income level increases. 31% of Prime Loyalists have an annual household income over $75,000 compared to only 14% of Non-Members, a 55% difference. Household income appears to be one of the biggest factors that will play into a Prime member’s decision to pay the price increase or cancel. Amazon already appears to be catering its Prime membership to a younger demographic. Respondents under the age of 55 were 22% more likely to be Prime members than those 55 and over. There are some key reasons that Prime membership may not be as attractive to this older demographic. First, they are more likely to be empty nesters, so they’re sharing the cost of the membership across fewer family members. Additionally, retirees with lower household income may be making fewer purchases overall and have more free time to shop and buy on a wider range of websites outside of Amazon. This means they’re not getting as much value out of their membership as those purchasing more frequently from Amazon. Make no mistake, Amazon isn’t losing sleep over the potential loss of Prime members. Several findings from our survey data indicate some of the ways that Amazon will easily be able to make up for any revenue lost from Prime membership cancellations. 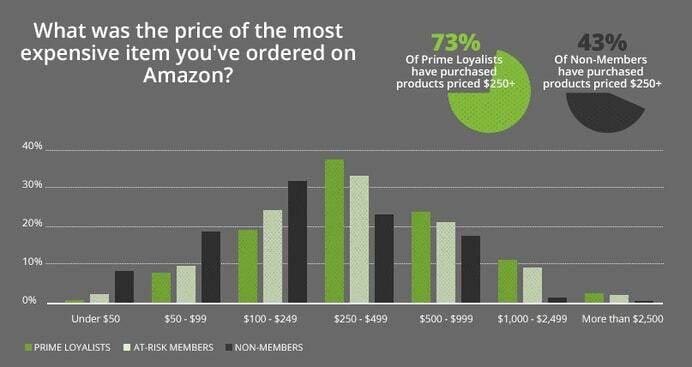 Our survey found that Prime Loyalists are more likely to purchase higher priced items on Amazon than Non-Members. When asked the price of the most expensive item they ever purchased on Amazon, a full 73% of “Prime Loyalists” responded that they have purchased a product priced $250 or more, compared to only 43% of Non-Members. Prime Loyalists are making more frequent Amazon purchases. 78% of Prime Loyalists are purchasing several times per month compared to only 26% of Non-Members. 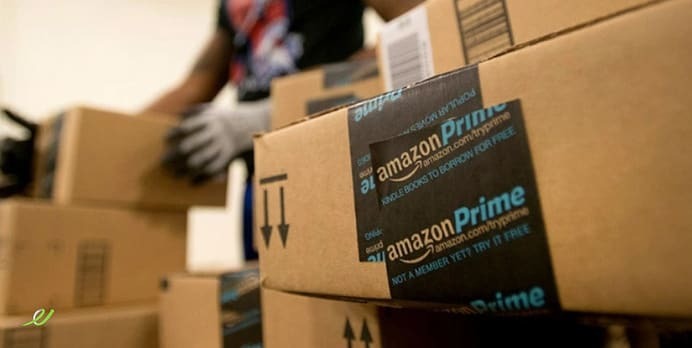 With the Prime price hike, Amazon appears to be banking on the idea that a higher membership fee will incent members to purchase even more frequently on Amazon to make their Prime membership investment worthwhile. But, when those At-Risk members begin to cancel and adopt shopping behaviors more similar to Non-Members, we’re likely to see their purchase frequency declining. 44% of Non-Members responded that they are only purchasing several times per year from Amazon. This is particularly concerning for sellers of items that rely on frequent, recurring purchases to justify their already low Amazon margins. One of the most notable differences in shopping behaviors between Prime Loyalists and Non-Members is their device preference. While a majority of all customer segments surveyed prefer to shop on Amazon using a computer, Prime Loyalists are 67% more likely than Non-Members to prefer shopping on a Smartphone. 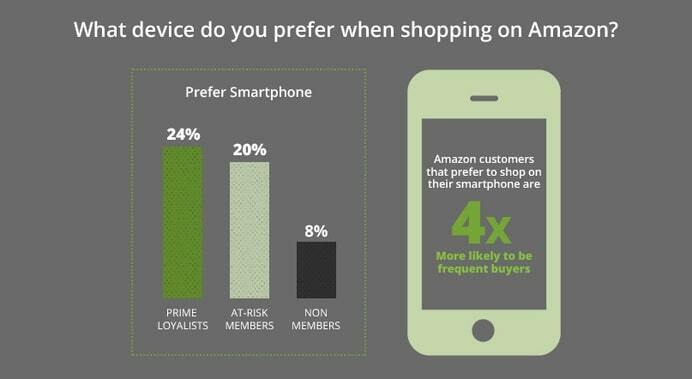 24% of Prime Loyalists prefer to shop on their Smartphones, compared to only 8% of Non-Members. With this data in mind, we expect to see Amazon investing heavily in more development and promotion of its mobile app to help drive higher purchase frequency, especially among its loyal Prime member base. 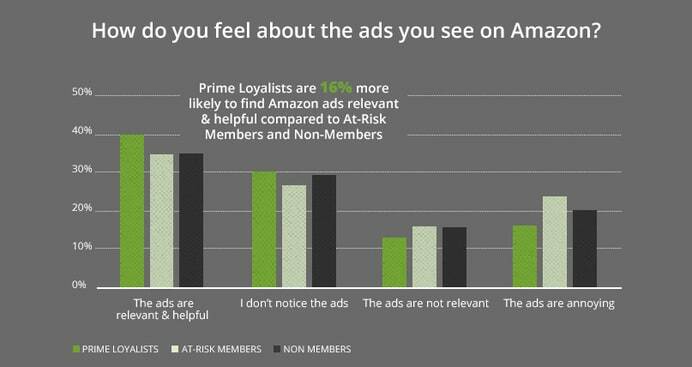 Prime Loyalists are 16% more likely to find Amazon ads relevant and helpful than At-Risk Members or Non-Members. If Amazon is generating more ad revenue from the Prime Loyalist segment than they are from the other prime member segments, then we should not expect a proportionate decrease in ad revenue. This is just one more way Amazon is able to hedge against a loss of current Prime members. If their advertising is already resonating better with Prime Loyalists, Amazon will continue to develop a more powerful Advertising engine to squeeze more dollars out of those Loyalists. Find out more about Effective Spend’s Amazon Management services! Our survey data indicates that Prime Loyalists are more likely than Non-Members to take risks when buying on Amazon. A loss of current Prime members may be threatening to independent or lesser known brands. 85% of Prime Loyalists responded that they are willing to purchase unfamiliar brands on Amazon, compared to only 77% of Non-Members, a 9% difference. It is much less risky for Prime members to try out new brands when they have the safety net of their Prime benefits, such as free shipping. Non-members, on the other hand, are more likely to stick to brands they know to reduce the risk of expensive shipping fees that they may only partially recoup if they return a product. 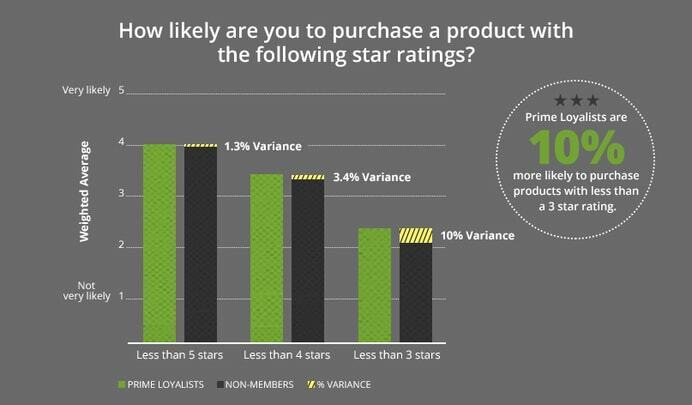 Prime Loyalists are 10% more likely to purchase products with lower star ratings versus Non-Members. 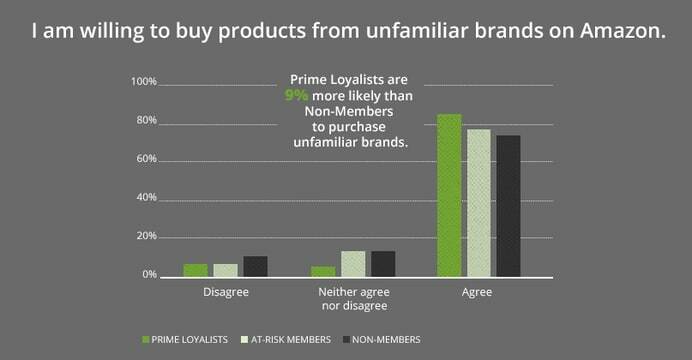 Just as they are more willing to explore unfamiliar brands, Prime Loyalists are also more willing to purchase lower star products. Once again, their Prime benefits protect them from risk. This may put more pressure on sellers with lower star ratings to begin offering Prime or to improve their star ratings to ensure they’re not losing out on the increasing population of Non-Members. Some product categories are likely to fare better than others as Amazon loses some of its Prime member base. 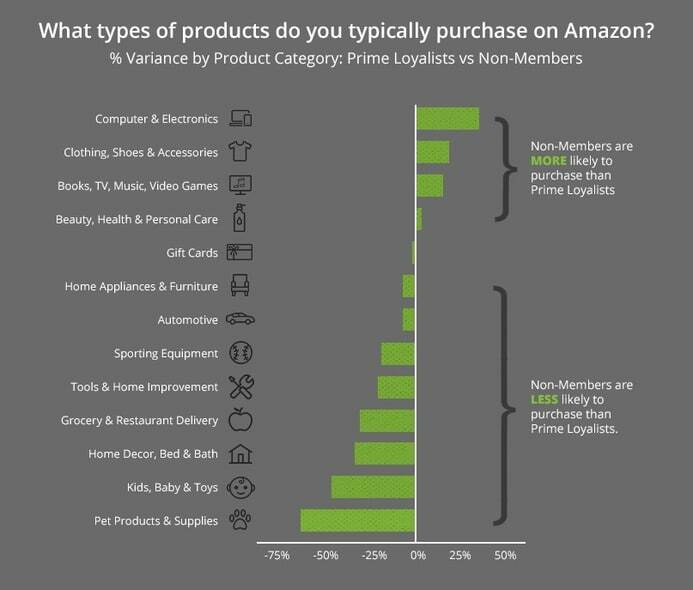 In our survey, we asked respondents what types of products they typically purchase on Amazon and measured the variance in responses between Prime Loyalists and Non-Members. To determine our winning product categories, we looked at the categories where Non-Members are more likely to purchase than Prime Loyalists. Within these categories, Prime membership is less of an influence on a customer’s buying decision. Therefore, At-Risk Members who cancel their membership are likely to continue buying from these categories at the same rates as before. Computers & Electronics – People shopping in this category are highly likely to be comparison shopping on multiple sites, especially with higher priced items like gaming consoles and laptops. Amazon provides an excellent comparison shopping experience with detailed filters and easy comparison charts. It’s also a category that benefits greatly from Amazon’s commitment to superior customer service. Media (books, TV shows, movies, music, video games) – Much of this category is represented by streaming content, and therefore, doesn’t benefit as much from some of the key Prime perks like free shipping and same-day shipping. Clothing, Shoes, Jewelry & Accessories – Amazon provides an unparalleled shopping experience for shoppers looking for a unique gift or clothing item that suits their particular style. Shoppers are more willing to forego the benefits of Prime if they find an item that is their perfect match. To determine our losing product categories, we looked at the categories where Non-Members are less likely to purchase than Prime Loyalists. In these categories, when the At-Risk Members drop their Prime membership, their purchases in these categories are likely to decline due to the absence of Prime benefits. Four categories stand out as the biggest potential losers, where current Non-Members are significantly less likely to be purchasing in these categories compared to Prime Loyalists. What these categories have in common is that they’re well-served by established big-box retailers. Big retailers are beginning to provide delivery services to rival Amazon through options like Google Express and Instacart. When a member cancels, they may be more likely to fill these needs with their local retailer instead of Amazon. Additionally, Amazon is beginning to produce and sell more products under its own signature brand, with many of those products falling in these losing categories. So, not only are sellers in these categories threatened by a loss of sales from canceling Prime members, but they will also be contending with Amazon directly for customers who do continue to purchase in this category. The survey data helps to paint a picture of Amazon’s immediate plans for the future. With the increase in its Prime membership fee, Amazon is doubling down on its core customer base – family households with the buying power to make very frequent purchases and to purchase higher-priced products. 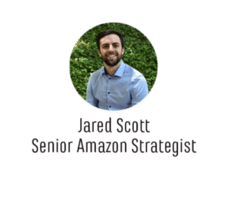 Despite an inevitable loss of some of its current Prime members, Amazon is well poised to grow its revenue from its best customers with a better mobile experience and a more sophisticated advertising platform. Interested in hearing more about our Amazon Management Services?